At Speedibake we're incredibly passionate about making delicious baked goods we supply to a customer base across all channels; foodservice wholesalers, contract catering, end users, export and retail. Since weighing out our first ingredients 30 years ago, we now operate 2 bakeries in Yorkshire. All baked fresh and frozen to ensure they are perfect when they reach our customers. At our head office site in Wakefield, we specialise in delicious doughnuts, custard tarts, mince pies, unbaked tart cases, sandwich baguettes and stone baked speciality breads. These include rustic rolls (ciabatta, petit pain, baguettes) and breads (ciabatta, focaccia, boules, batards). Available in plain white, harvester variants or lots of flavours such as honey & sunflower, onion, olive, red leicester cheese & pumpkin seed and mediterranean. 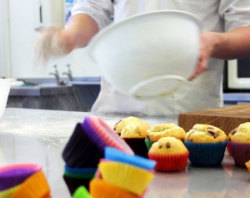 Bradford houses production of an array of amazing sweet muffins; indulgent flower-pots, American style mushrooms, bite sized minis and great big jumbo muffins. At Bradford, we bake lovely sandwich baguettes and French sticks. We use our freshly baked bread to make our fabulous garlic baguettes and garlic slices. They are great as accompaniments to a whole host of meals, and our garlic slices make a lovely starter! Also, we are proud to be a part of the Associated British Foods Plc family, a highly diverse business with many household brands. So, we operate as a vertically integrated food business, delivering quality produce from farm to plate.